Sorry for double posting, I thought I had fixed things but no I definitely haven't. Getting this error on the update page after putting in my info. Thanks. I actually had the same issue @martin2008 describes above. The update page never said that the installation was successful. But in the footer of the dashboard I see the new version number and assumed it was all okay. Hello, I uploaded the files to the new version but had to roll back to the previous. I run an integrated forum and only a blank screen appeared. Ideas? I suggest starting a new discussion with details of what "integrated" means after following the additional troubleshooting steps linked in the OP. Also check your PHP error log. On the database table GDN_Tag, delete the index named UX_Tag, and then run it again. It should then regenerate correctly. @Simeon_Griggs @martin2008 I need the error message to assist you. Have you completed the troubleshooting steps? Since the last step says "Start a new discussion" and you are still posting in the release thread, I suspect not. @Chalipa Please check your PHP error log for the error message and start a new discussion for assistance. I followed the steps in the OP, and getting a blank page, no errors. Need to roll back while we figure out how to correctly make the update. That will show you the real error. Don't forget to delete if from config.php after you are finished with debugging. I tried going to "yourforum.com/index.php?p=/utility/update" (substituting my forum's domain name for yourforum" as stated in the Read Me instructions, but I just get "Error 404-Page Not Found". I use Expression Web as an ftp upload program, but it will not show the .htaccess file or allow it to be downloaded from the server. I went directly to the server & located the .htaccess file, but don't know how to get it replaced by the new file. Any suggestions? I am not very proficient in websites & don't understand the "techy" language so if replies could be kept simple, I'd appreciate it. No bonk screen. I might be something very noobish (like read/write permissions or something), I only very rarely play around with the Vanilla forums on our website, but I'm trying to update because of the influx of spam we've been getting. I tried this; still getting blank page. 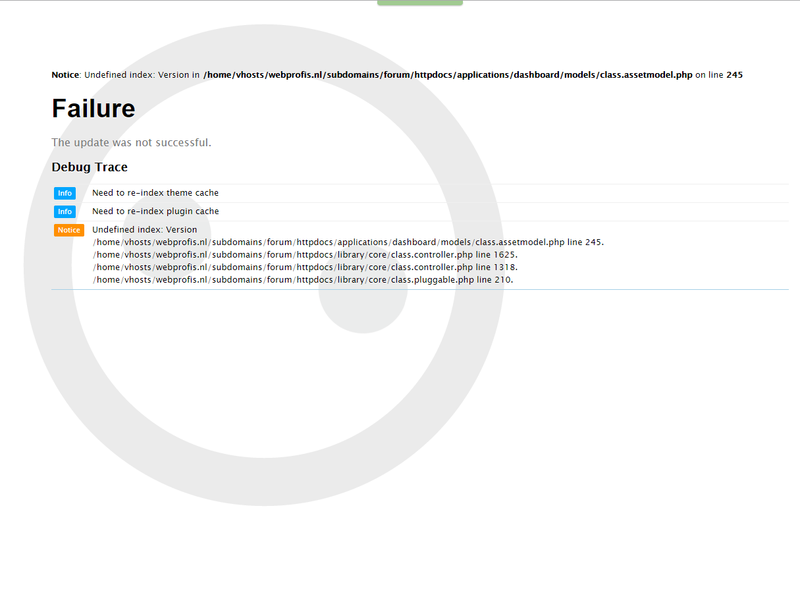 @JeffHat Check your PHP error log. JeffHat Check your PHP error log. Searched on how to find my PHP error log, but I can't seem to find it. Where is it located on the server exactly? We have released 2.1.8p2 which addresses problems in the utility update process. Please update if you had issues with the /utility/update. The change is not needed otherwise at this time. I guess you have a problem with your forum being embedded. If I open up http://worldwarmachine.com/wwmforums/ I see your forum for a blink of an eye before I get redirected. Not sure how this helps because I don't do anything with embedded forums but that may be hint for someone else. Yes the forum is embedded. Will need to look into that. i replaced the 15 files and tried to upgrade. I got this message when trying to upgrade: how can i solve this?